On Friday I had a small oral surgery to correct a birth defect that has been a problem for the past 2 years. Oral Surgeon Dr. Andrew Glenn implanted a small titanium screw into my upper jaw yesterday to act as an artificial root for a tooth that Dr. Chris Haag will be crafting and mounting to the screw in about 5 months. Why Did Thor Have a Hole in His Grill? I have a genetic defect that results in a missing tooth right beside my right canine. With no adult tooth to push its way through, I had a baby tooth in mouth for over 30 years. Right before the filming of Next Internet Millionaire, I broke the tooth on a TicTac. Dr Haag slapped a temporary CERIC tooth on what was left of the baby tooth to get me by for the filming, but we both new it wouldn’t last. 2 weeks after coming home, I lost that false tooth to an Arby’s Classic Italian Sub. I was battling with my food, and for the time being the food was tearing me up! Dr. Haag later extracted the remaining piece of tooth, and issued me a device called a flipper. Its basically a retainer with a tooth facade on it. This way if I had any important meetings, I would not look like a toothless idiot. The implant that Dr. Glenn dropped into my jaw acts as an artificial root – an anchor to give the ceramic tooth that Dr Haag will install some biting strength. 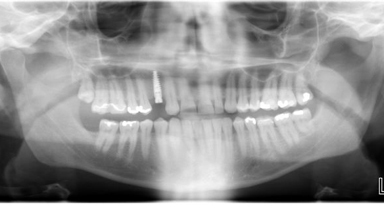 The implant was screwed in place with a small torque wrench using only local anesthesia. After 5 to 6 months of healing time, the implant will be evaluated to ensure my body is not rejecting it, and then a tooth will be placed over the top. As is the case with most dental procedures, the anticipation of the pain was far worse than the actual event. In fact, I honestly did not feel, taste, or smell a thing. Dr Glenn and his staff were awesome and had me in and out of the chair in less than 20 minutes. He told me Motrin should be all I needed for pain, but I already take a lot of that for my back and since the weekend was around the corner, he wrote me a prescription for Vicodin just in case I needed it. The good news is that after the Novocaine wore off I am experiencing less pain than I have experienced with many cavity fillings in the past. This guy is GOOD. He drilled a hole in my skull and then stuck a screw in it and I was playing Frisbee with my son the next morning. Sounds like the operation went smoothly. I do hate the anticipation of things like that. You usually don’t know exactly what to expect going in.